Things for the Dungeon. Started 9-3-05, and Narg from Hasslefree miniatures is my spokesmini for this page. He will get you into the dungeon. Here we are at the main entrance to the dungeon. 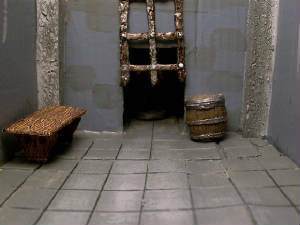 Some of my customers wanted a few things you might find in a Dungeon, so I started a whole new kit. Dungeon Decor will have a few pieces of torture items, and all the nice things you see in a torture chamber, plus some basic stuff for dungeons. Hey Narg, can you get us in? Mmmm, busiba opun da gate.....mmmm. Well you are in now. Did you notice the tile? The Tile is my newest item. It measures 3.5"x4"x1/8"
Heresy makes some great mini's for a dungeon too. The detail in the pictures of Narg can bring any model to life. I have only 4 items in the pictures. 1. The main gate from my steel set. 2. The table from the undead kit. 3. A barrel from the cover kit. 4. The tile floor. The rest of the model was a shoe box till I got my hands on it. . The axe is part mine and part Warhammer pieces. Now on to Nargs playground or click the link below to get Narg. You can have the unlucky souls chained to walls. We go in and I show you dungeon toys.....Mmmmm. A rack, a stretching table, and a whipping post. Add a hot poker, and your prisoners will talk. The kit includes 1 stretch table, 1 rack, 1 whipping post, 1 extra rope, and a whip. Oh stop screaming! No one can hear you anyway.